Telecoms may have emptied their infrastructure upgrade budgets early this year, and fiber-optic equipment providers are scrambling to navigate this temporary challenge. 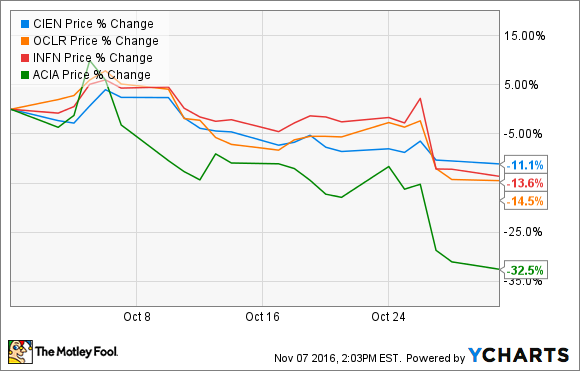 Shares of many fiber-optic networking stocks fell hard in October 2016, according to data from S&P Global Market Intelligence. For example, long-haul networking equipment makers Ciena (NYSE:CIEN) and Infinera (NASDAQ:INFN) fell 11.1% and 13.6% respectively. Optical components providers Oclaro (NASDAQ:OCLR) and Acacia Communications (NASDAQ:ACIA) dropped 14.5% and 32.5% lower. As you can see in the chart below, all of these stocks largely moved in tandem throughout the month. October started out on a positive note, as Acacia issued rosy preliminary results. Analysts checked out Ciena's mid-quarter business trends and came up with another sunny review. Another Wall Street firm started coverage of Oclaro with a buy rating, citing multiple long-lasting demand drivers for fast fiber networks. For a while, the sector was stuffed to the rafters with wine and roses. But the market tenor took an abrupt downward turn near the end of October, when Infinera reported solid third-quarter results with a side of weak guidance for the fourth quarter. Infinera shares plunged lower 14% the next day, dragging the fiber-optic sector as a whole along for the ride. It wasn't all Infinera's fault, as China-based rival ZTE also issued soft next-period guidance the same day. In particular, Acacia's tremendous dip should be pinned more on ZTE's weakness than on Infinera's, because ZTE happens to be Acacia's largest customer. In a conference call with analysts, Infinera CEO Tom Fallon noted that end-market demand is "soft" in both Europe and North America. Large voice and data-network operators appear to have exhausted their capital expense budgets for their current fiscal years, leaving little room for a positive bounce at the end of 2016. The same imbalance between short-term supply and demand should lead to similar weakness across the industry, which explains why so many fiber-optic networking stocks followed the same general trading path in October. That being said, I see no reason to give up on the long-term promise of fiber networking. In fact, October's price drops may have uncovered some excellent buy-in opportunities. Wireless networks stand on the very threshold of rolling out much faster 5G services over the next couple of years, which will require a beefy round of infrastructure upgrades behind the scenes. Everybody in this roundup, from equipment builders Ciena and Infinera to component suppliers Oclaro and Acacia, will see plenty of high-volume orders as this cycle rolls along. So don't give up on any of these companies yet. All of them are worth at least a closer look right now.